How is Heroin Abuse Diagnosed? Heroin addiction is yet again on the rise. Young people largely drive the trend of heroin addiction, with 156,000 trying heroin for the first time in 2012 alone. This figure represents a near doubling of heroin use rates since 1997, suggesting a heroin addiction epidemic is well under way. Heroin is a central nervous system depressant, which means it slows down activity in your brain and spinal cord. Users often report a sense of euphoria, but observers are often struck by the slow, sluggish reactions of heroin users. Track marks in the arms or legs from injecting the drug. Contracted or dilated pupils (miosis, in medical terms). Shortness of breath or slow, shallow breathing (a grave side effect, as users can experience respiratory arrest as the end result). Vomiting (or emesis) as heroin, even in small doses has effects in brain regions like the area postrema, which can elicit sudden nausea and vomiting - quite dangerous in the situation of unconsciousness or partial unconsciousness, which also occurs with heroin abuse. Frequently disappearing to use more heroin. Changes in work habits or commitment to family obligations. Unexplained health problems, such as frequent vomiting or illness. Contracting a blood-borne disease, such as HIV/AIDS as a result of intravenous drug use. Cycling between excessive alertness and excessive sleepiness (apparent as users frequently nod off, a phenomenon often referred to as "the nods" in those high on heroin). Heroin and, to some extent, all opiate derived medications can lead to histamine release, resulting in itchiness (nose scratching is a tell-tale sign) or skin-picking. The effects of heroin abuse are cumulative, starting small and then steadily escalating out of control. The specific ways in which heroin affects you or someone you love depends on a number of factors, including use of other drugs, age, health, underlying medical conditions, lifestyle factors, and frequency and duration of heroin use. There's no fully accurate way to predict how heroin will affect a person, however. One person might have relatively minor effects while another may become severely ill within a few weeks of starting heroin. Likewise, someone who's gone years without any dangerous side effects may suddenly develop a host of health problems. Relationship, career, legal, or financial problems. Dental problems such as tooth loss and inflamed gums. Contracting communicable diseases (HIV, hepatitis viruses, etc.). Frequent illness and decreased immunity. Depression, anxiety and other changes in mental health. The inability to feel happiness without heroin. Changes in fertility and sexual function. Disruption of the ovulation and menstrual cycle. Heroin abuse can be lethal. If you observe these signs in yourself or a loved one, do not wait to seek help. Call us today at 1-888-993-3112Who Answers? to find treatment centers in your area today. Mixing heroin with other substances is an extraordinarily dangerous undertaking, even for someone with a high tolerance and a long history of drug use. Famed actor Phillip Seymour Hoffman is just one name on a long list of people whose lives were destroyed when they mixed heroin with other drugs. such as alcohol or sleeping pills, heroin can induce a coma or cause your breathing to cease. When combined with stimulants such as amphetamines, heroin may lead to psychotic episodes, aggressive behavior, and delusions. Even if you've done it before, the next time you mix heroin and other drugs could be the time your decision is fatal. Many heroin addicts continue using the drug even when it no longer produces a pleasurable high. Some are willing to give up everything in their lives to keep using. It is this combination of chemical dependency and persistent use that constitute addiction. Your treatment provider will work with you to evaluate how heroin affects your life, and then deliver a diagnosis. Heroin is widely recognized as one of the world's most addictive drugs, so even intermittent recreational use can ultimately result in addiction. Anyone can become a heroin addict. A family history of addiction, stressful life circumstances, a history of mental illness, and a history of psychological trauma all increase a person's risk for addiction. The most significant risk factor for heroin addiction, though, is heroin use. It is impossible to become a heroin addict without trying the drug, no matter how many other risk factors you face. With sufficiently prolonged use, though, virtually every heroin user will eventually become an addict. The National Institute on Drug Abuse estimates that, at any given time, 23% of heroin users are addicts. However, this doesn't mean that the drug has a low rate of addiction. Instead, it means that a large portion of users tries the drug just once. With persistent use, addiction is inevitable because your body will steadily become tolerant, necessitating a larger dose to feel the same effect. With that larger dose comes chemical dependency, and eventually, addiction. In the 1990s, fashion designer Calvin Klein ushered in the world of "heroin chic." The look was thin, pale, and hollow-eyed, but it came at the right cultural moment. Heroin use saw a significant surge in the 1990s. Changes in fashion and the heroin chic look have given way to dozens of other aesthetics over the past two decades. The best time to seek help for heroin addiction is always today. Addiction is a chronic, progressive, and potentially terminal illness that will not go away on its own. Your addiction will be worse a month from now than it is now, so if you're on the fence about seeking treatment, don't delay. Difficulty imagining your life without heroin. Using heroin to cope with the effects of mental or physical illness. Relying on heroin not to get high, but to feel "normal." Endangering yourself to use or purchase heroin. Suffering from health problems due to your heroin use. Hearing from a doctor or loved ones that you need to seek prompt help. Get Help Today Find a Narcotics Anonymous meeting for you or your loved one and get support for heroin abuse. First, addiction is a disease that addicts don't choose, which means that addiction will only get better with proper treatment. Second, treatment works, and many treatment options are available. Even if your loved one has previously failed to quit, this time can be the time he recovers for good. You can't force someone you love into recovery. All you can do is set clear boundaries and endeavor to protect your well-being. Some people stage an intervention or even hire professional heroin interventionists to encourage their loved one to seek treatment. If your loved one refuses to seek treatment, it's your job not to further enable the addiction by giving your loved one money or making it easier for him or her to use drugs. Setting boundaries might feel cruel, and you may find it incredibly difficult as well. But addicts whose loved ones don't set clear boundaries have little incentive to quit. Call our confidential hotline at 1-888-993-3112Who Answers? to discuss how treatment programs can help a heroin addict today. If you're struggling with the pain of addiction right now, you might not believe things can ever be better. That's the disease talking, not the truth. Addiction is treatable, and the sooner you seek help, the faster you'll be able to recover. Outpatient programs, which you attend while continuing to live at home. Inpatient programs, which offer you a drug-free place to live while you pursue sobriety. Some addicts transition from inpatient to outpatient programs. With outpatient treatment, you can select just one option or blend several to get a custom-tailored heroin recovery program. Outpatient substance abuse treatment typically allows you to remain at home or in your current job while recovering. Therapy: Therapy with a licensed counselor to help you better understand your addiction, develop stronger coping skills and work on your relapse prevention in a comfortable setting. Medical detox: This helps get you sober while keeping a close eye on your health. Some medical detox programs are outpatient while others require a brief inpatient stay. 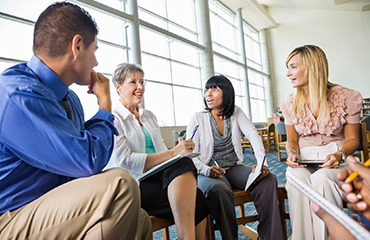 12-step programs and support groups: Narcotics Anonymous is the world's most popular recovery program. Meetings are free and accessible, completely peer-run and offer you the chance to pick a sponsor who can help you navigate the recovery process. Intensive outpatient/partial hospitalization programs: These programs are often part of the transition from inpatient rehab to independent sober living. They offer services such as therapy, medical detox, and group support. Unlike with inpatient treatment, you go home at the end of the day though intensive outpatient programs typically demand a significant time investment. Inpatient rehab is an ideal way to get sober because it takes you out of a stressful environment and places you in a supportive drug-free community. Most inpatient programs rely on a combination of therapy, medical treatment, support groups, and life skills training, but every rehab is a little different, each offering a unique spin on recovery. Inpatient heroin treatment can be of varying duration - 28 or 30-, 60-, 90-day or more, depending on need. In addition to traditional rehab programs, other options are increasingly popular. Luxury treatment facilities: These offer the same benefits of inpatient rehab, but in a luxurious, resort-like setting. You might attend cooking and yoga classes, have access to a spa or luxuriate in a beautiful setting. In most cases, you'll also have a private room. Executive treatment facilities: These cater to busy professionals and high-profile executives. The facilities are designed with luxury in mind and offer meeting spaces, the freedom to conduct business throughout the day, and business supplies such as computers and fax machines. At some facilities, you may even be able to meet with clients in offices that look nothing like a rehab facility. 1% of high school seniors have used heroin at least once during their lives, with 0.5% using the drug during the last month. The percentage might not seem like an indication of high use, but it means that 1 in 100 teens has tried the drug, and 1 in 200 is using it now. Your child likely has friends or acquaintances that have tried heroin. Its increasing popularity with young people means that it's readily available to teens who are depressed, want to try something new, or who want to defy their parents. Teen heroin addiction is virtually identical to addiction in adults, but with one important distinction: Teens' brains are still developing. Thus, heroin use among young people has the power to alter brain growth and development. This makes prompt treatment not just an ideal outcome, but the only possibility for preserving the long-term health and well-being of an addicted teen. It's not possible to force an adult into recovery, but things are different with teens. Parents can and should mandate treatment for kids struggling with addiction. The costs of failing to do so are far too high.